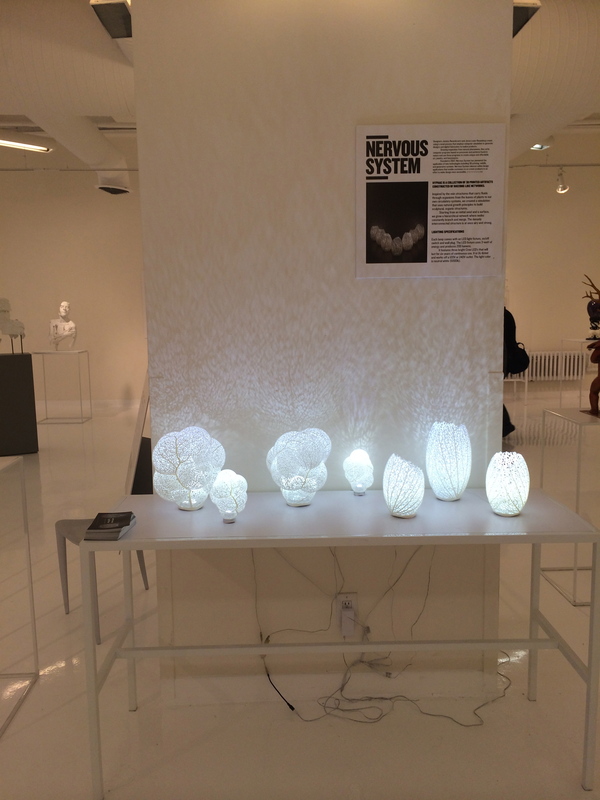 This past Saturday I spent the day at the 3D Printshow NYC 2014. It was a perfect day for an indoor activity because of the snow was falling sideways and would hit you in the face if you were walking west. The show was in a small event space called The Metropolitan Pavilion. The space gave the event a cozy fell. I did not attend any of the speaker events as the nothing on the schedule was of interest to me. The discussions were of topics I had heard before many times over. So I thought it best to hit the showroom floor and see if there was anything new to be seen. There were a few interesting things that I had not see before. I had not experience getting myself scanned so I tried it at the Fuel 3D. Fuel 3D is a low-end or Prosumer 3D scanner. I have seen a lot of these do a Kickstarter. 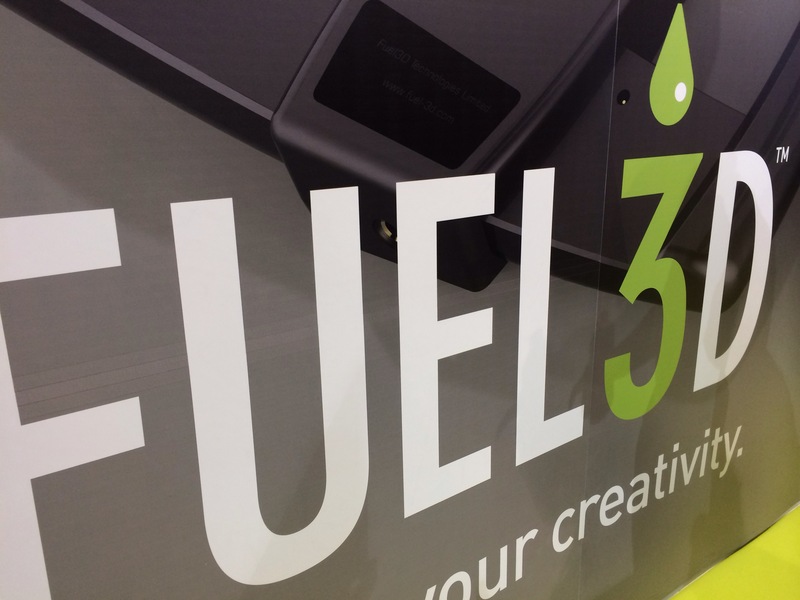 Fuel 3D was no exception, they did a very successful Kickstarter. Luckily there was not much of line which meant that I became second on the list to get my face scanned. See title picture above for how it came out. It looks very detailed. The operator took the 3D image in seconds, then transferred it to a computer and then manipulated it so that only my face was showing. The software looks very very easy to use. I then stopped by a high end machine that cost thousands of dollars. While the imaging was a bit more detailed it did not needed to be. The low end technology is catching up to the high end. Below is my image scanned by the higher-end machine. Take a look at the detail, but also see how more complex the software is. The UI could be made to be more user friendly. 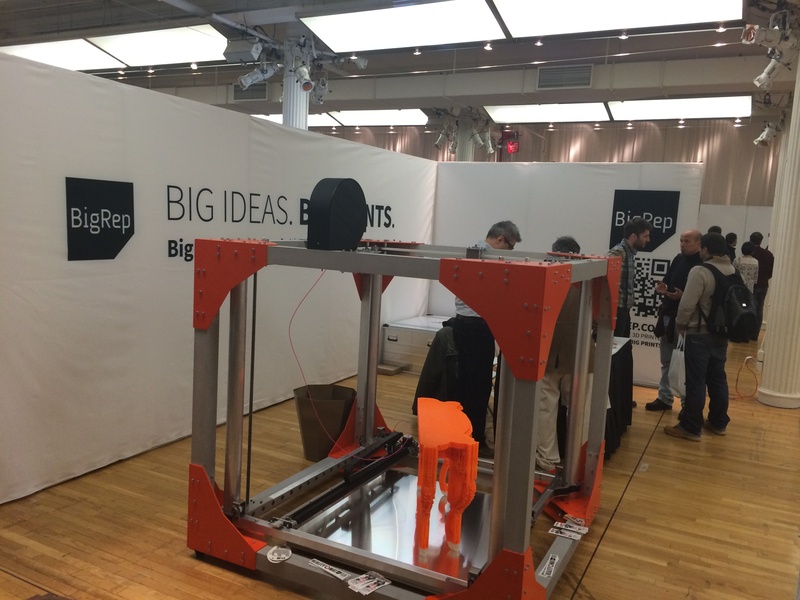 I saw a hugemungus 3D Printer company called BigRep. Their 3D printers can print full-scale objects. What I saw were prints that looked like they needed a lot of finishing. And some prints that looked like they had problems being printer. The object pictured below being printed would take up to a week to complete. This is not ready for primetime yet. Nice idea and maybe it will happen, but not now. The prints were very bad looking. 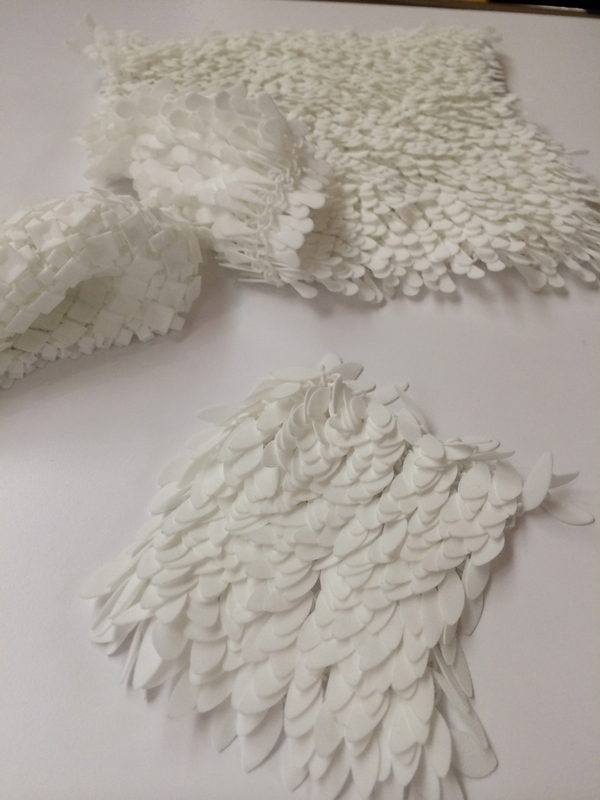 I stopped by another booth that had some amazing 3D prints of what looked like complex textiles. I would say it was sort of like chainmaille, but close to being made into clothing. The feeling of these 3D prints was excellent. They had great detail. You could make this into a garment if you could print enough of it. The company uses laser sintering machines. These machines use lasers that solidify a powder. After printing the print goes through a finishing process. The process unfortunately produces 50% waste of the powder. That is a lot of waste that gets produced. What a shame. 3D printing is suppose to be good for the environment and not produce waste, but the reality is that not all 3D Printing methods can do that. There was fashion gallery and an art gallery. Both rooms housed some interesting 3D prints. The fashion gallery looked like it had mostly accessories and 3D prints mixed into text tiles clothing. 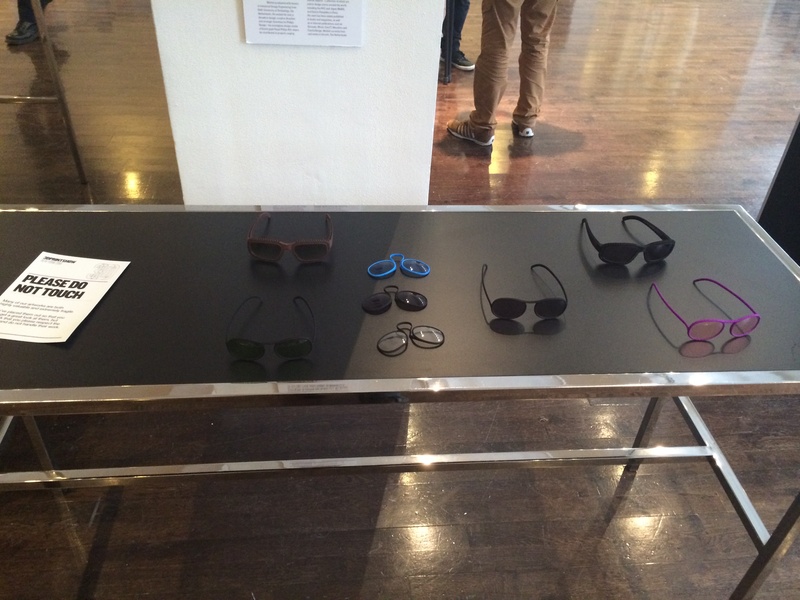 One of the most interesting ones was the 3D printed glasses. See picture below. Imagine the possible designs you could do. The designer created ones that fit on your nose snuggly and ones that had flexible temples. The flexible temples looked like they were the most practical. The lamps in art gallery were amazing. The organic feel and look of them made it like they just grew there. See picture below. On the way out of the show I could not help come away with the feeling that the market for consumer/prosumer 3D printers was getting crowded. Makerbot is the big gorilla in this market and they are sucking the air out for the competition. While I did see a few new players they did not have anything new to offer that would be any better. There are still the two markets at this point, the maker market that wants to tinker and maybe build a 3D printer like PrintrBot and there is the consumer/prosumer market that wants it to work with good detail out of the box. It will be interesting to see if expired patents will spur any more innovation into the market to produce anymore viable players. It would be great if someone could figure out how to combat the 50% waste problem. This article and video got me thinking of how 3D printing can, will and has changed the jewelry business. The flexibility that the computer aided design software gives is just incredible. Some hard to make intricate designs can now be easier to make. I took a look at the Solidscape T76 3D wax printer that is used in casting parts. 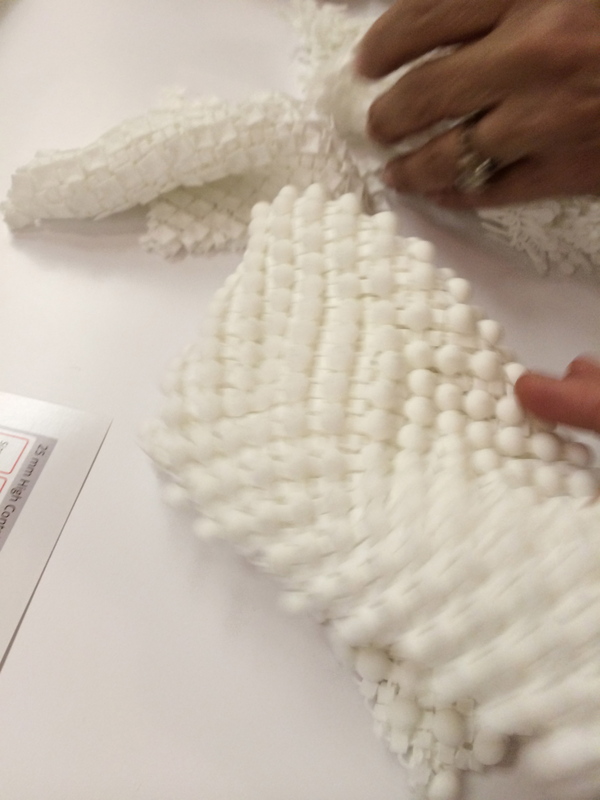 The printed wax is used to make a cast. Turns out this is an elaborate five stage process, including the pouring of the molten metal into the cast, cooling and then polishing. The other way of printing jewelry is to use a printer that prints in metal. This process uses glue and a powder form of the metal. The glue and metal are printed in layers and then it is heated, then polished. This video that shows how GE is using 3D Metal printing to print newly designed parts for the aerospace industry. Imagine what you could design when prices come down on these printers.